Wanna make your college event / fest successful? 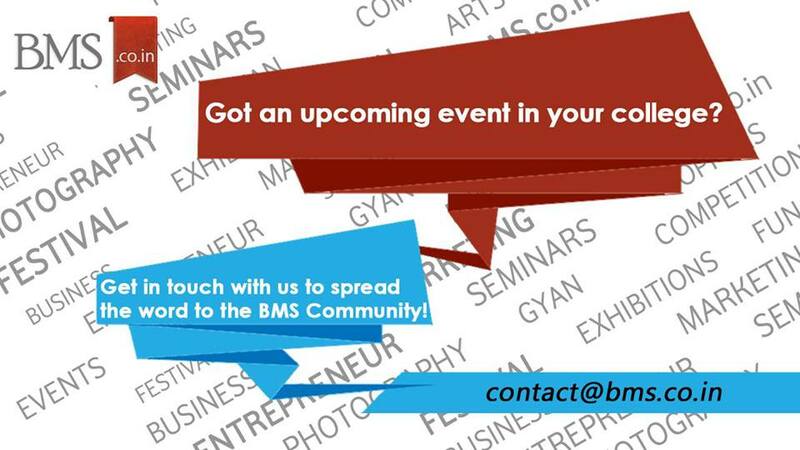 BMS.co.in would love to be the ‘Online Media Partner’ for your College Event / festivals. Events could be: Call for Papers, Seminars, Conferences, Competitions, Fests, Essay Competitions, Debates etc. BMS.co.in is Mumbai’s most popular and No. 1 website for BMS students. BMS.co.in is committed towards sharing useful information for BMS students and connecting BMS students across 100 BMS colleges in significant ways. College events’ organisers are welcome to use our reach and traffic to publicize their events through our platform. With so much time, money and effort going into the planning and organisation of any event, we’ll make sure that it’s a successful one! In case you wish to make BMS.co.in as your event’s media and marketing partner, you can contact us at contact@bms.co.in to publish your event. A mention of BMS.co.in as the ‘Online Media Partner’ on your official webpage, fanpage etc. The BMS section of L.S Raheja college (Santacruz west) is organising it’s intercollegiate festival GLADIUM from the past year. This year we will be highly obliged to have you in association with GLADIUM’16. Please let us know as soon as possible. Thanks, please print the above MoU on your college letter head and send it to us on contact@bms.co.in with your college hod and principals signature on it.